Home › Archives › Modify your swap space by configuring your Linux machine to use LVM as Swap Space. › Modify your swap space by configuring your Linux machine to use LVM as Swap Space. Whenever you increase your RAM, computer experts always suggest us to increase the swap accordingly because it is always beneficial to increase your swap space accordingly so that your Linux Machine perform smoothly even for memory-intense(memory consuming) operations and applications which consume more memory. This is not the only but it is one of the method to modify your swap space in linux.So today in this article we will discuss how to modify your swap space in linux when needed and we will learn how to do that in detail and in few simple steps.. Since we are going to discuss about modification of swap space using lvm here that's why first we will start the procedure by configuring LVM. If you were new to concept of LVM you can read our articles on LVM because here we will discuss only a brief about the lvm configuration and its integration with swap file. Since we need to create LVM to complete this article so let's begin with creating partition and configuring lvm. For extending swap on lvm let me first create lvm. Step:1 Create partition and set it type to LVM. Read how to Create Partition in Linux here. Step:2 Update kernel using partprobe. After making so much changes in partition table we need to inform kernel about these changes made.For that we use partprobe command. Step:3 Intialize Physical Volumes using "pvcreate" and then Create Volume Groups using "vgcreate". Step:4 Configure setting for LVM using command line tool. Step:5 Creating a FileSystem on LVM. Step:6 Configure Logical Volume to be used as a Swap Space. Now we are going to use Logical Volume /dev/vg00/lv00 to be used as swap partition.First thing we do is to format logical volume using mkswap and then activate swap on that partition using swapon command. Step:7 Make an entry inside /etc/fstab file for Permanent existence. Permanent mounting is needed to things to be remain as it is even after reboot.I assume that you already know how to mount. I have mentioned permanent mounting in many of my articles. Now it's time to test if the logical volume was successfully extended or not. Both command will help us to inspect the swap space. 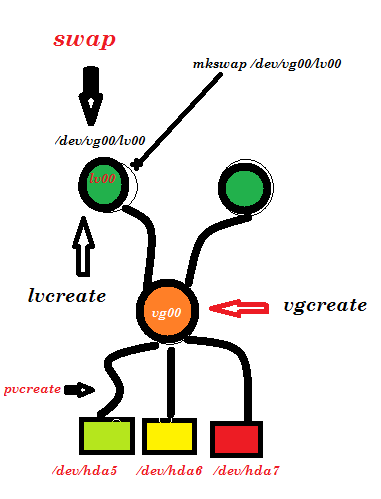 Hence we have seen how we can use lvm to increase or decrease swap space according to our need.If we increase our physical RAM we need to increase our swap memory accordingly and for that we need to reduce swap lvm2 space and if we are decreasing our physical RAM for some reason we will need to decrease the swap space accordingly. You may intrested to Read Article on Advance Guide to LVM. You may also be intrested in read below articles related to LVM.